Tex is a big boy. When he first came to Wayside Waifs, he weighed over 30 pounds! Now, he's on a diet. He eats low-cal kibble and treats & wet food are a big no-no. The volunteers try to get him to exercise, but he's not much into moving around yet. 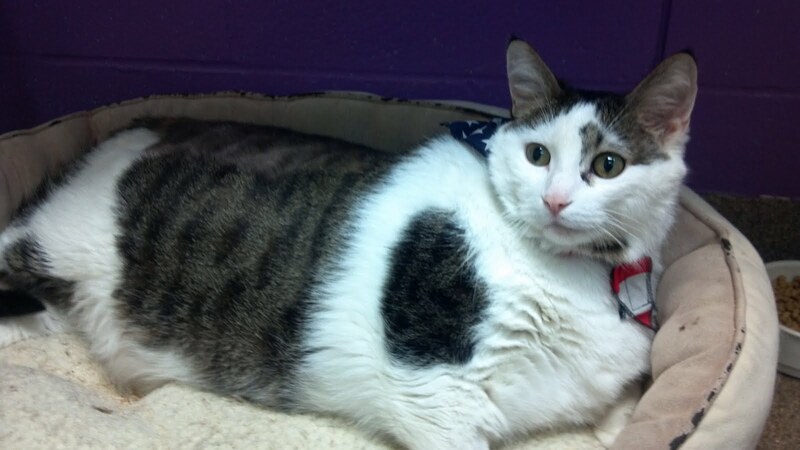 Tex will need a home that is willing to keep up with his weight loss program. At five years old, he has the potential to live many more years, but like humans, his obesity puts him at risk for health issues. 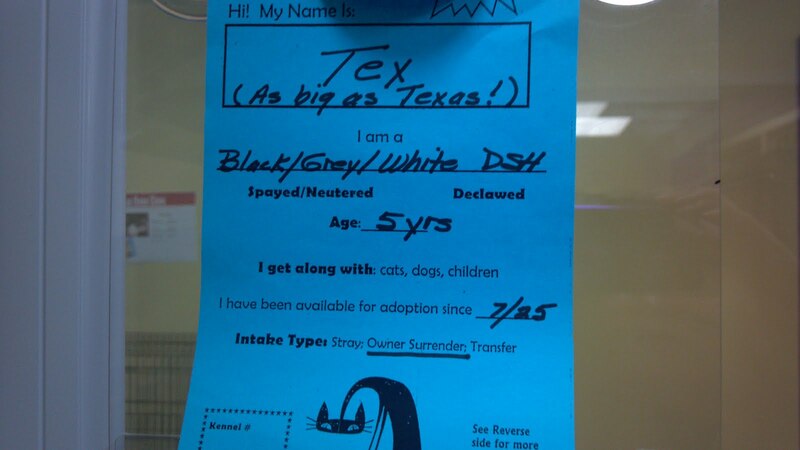 Tex's previous owner was a man and from his reaction when Dad met him, Mom thinks he is a "man's cat" meaning he might like a home where there is a man rather than just a woman. He's a little shy and likes to be hidden away, but if people go slow with him, he likes to be petted. In fact, when Dad was petting him he purred and purred. Tex will make a great companion and will do well in a home where his family pays close attention to his eating and exercise habits. Maybe he'll even get skinny enough that he won't be "as big as Texas" like his kennel card says! 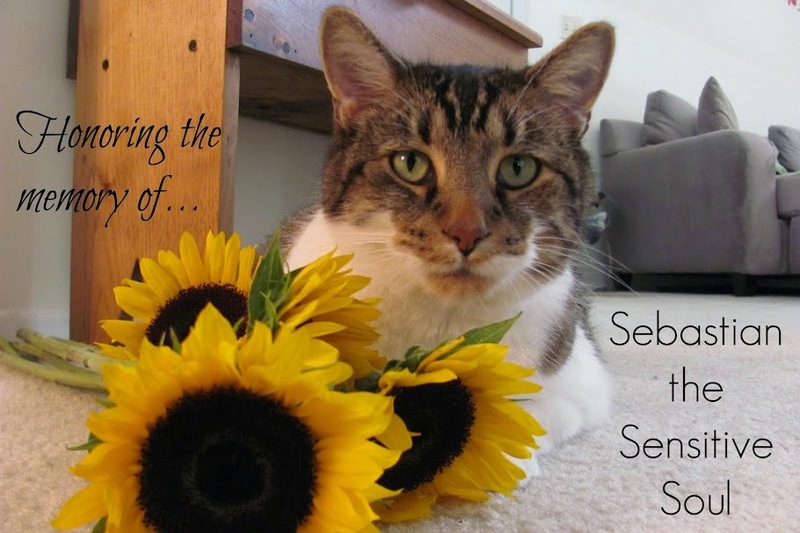 This week's featured furry is a special needs kitty. Dusty is a sweet girl who needs to go to the perfect home. Dusty has been at Wayside Waifs since March and although all the volunteers there love her, they know she's been there WAY too long. It's hard to find the right home for a girl like her though. You see, her ribcage never formed correctly, so she has to be handled just so in order to protect her internal organs. There's a sign up on her kennel explaining her unique situation. 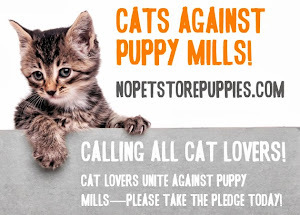 Oh, and that little kitty face in the sign? That's a magnet painted by one of the volunteers. Dusty's adopter will get to take that home too! That's quite a deal if you ask me! ME-WOW! Do you know the right person for Dusty? She does like to play, but shouldn't be around young children or other pets that may accidentally harm her. Make sure to spread the word and let's get her out of that kennel and into her forever home! I was lucky enough to be tagged by the stunning Cathy Keisha to tell you a little about myself. There are some very personal questions, but I'm willing to answer them in the interest of sharing with my anipals. 1. Where do you like to hang out? My favorite place is wherever Mom is. I'm not ashamed to say I'm a Mama's boy and I like to be close to her. She spends a lot of time in the office since she works from home, so I do as well. There is a futon in there for when Grandma and Grandpa visit. I love to nap the day away there, but don't tell Grandpa. He wouldn't like knowing I'm laying on the same bed he is! 2. Who is your favorite kitty crush? *blushing* I've never said this out loud, but I'm pretty sweet on Daisy the Curly Cat. She already has a mancat in her life though, so I just admire her from afar. She looks so pretty in her outfits and she's really smart. You should see her do her modeling shoots for treats! 3. What is your favorite scent? I absolutely love salmon! When I get a whiff of my dried salmon treats I am in heaven! I like anything on Animal Planet. If Mom and Dad are going to be gone for a while they will leave the TV on for me on Animal Planet. I also like the Golden Girls. Well, Mom loves the Golden Girls and watches it every night. Since I'm always with her, I watch it a lot too. I don't have a favorite movie. The only thing Mom watches that lasts that long are Red Sox games. 6. What is the best piece of feline wisdom? There are a couple of rules I live by. First, cuddle all you can. It's those moments you'll remember when you look back at your life. Second, eat the good noms first. It's kind of a play of the JFK Jr. quote, "Wear your good stuff now." Why save the yummy stuff for later? Make the most of every moment. I really hope they all play along! You've heard me talk about my former shelter, Wayside Waifs, and my favorite adoption counselor there, Sharon. She encouraged Mom to adopt me (she knows a good match when she sees one) and now she's doing something just as pawsome. She has made a video about what she does at the shelter for a competition hosted by her alma mater, Capella University. The winning videos get a $10,000 grant and of course this means that Wayside Waifs would get the prize! That would buy a LOT of mousie toys. Scroll down to the "Community Submissions"
Click on the right arrow until you see the screen shot of cages titled "Achieving my Goal of Making a Difference in the Lives of People and Animals"
You can vote every day and I hope you will! I'll be sure to send out reminders so you won't forget. Thanks for voting! This week's featured furry is a double feature! 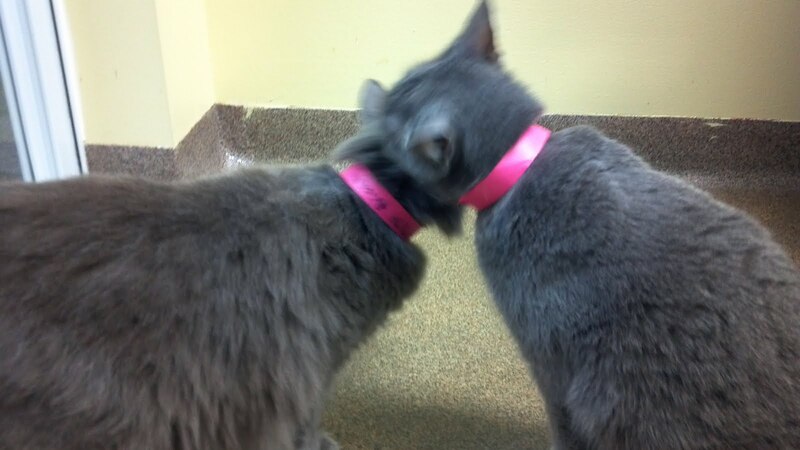 Rosie and Priscilla are besties who have lived together all their lives and need to go home together. They're both 5 years old and just as friendly as can be! 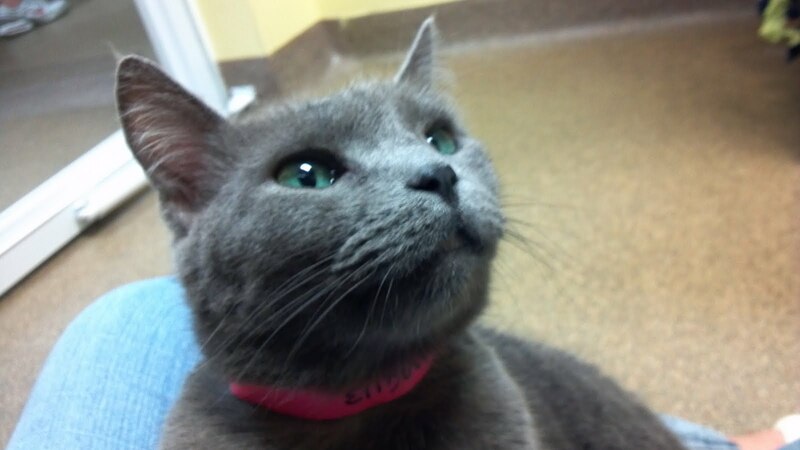 She's a Russian Blue Mix and has the most beautiful eyes! She climbed right up on Mom's lap and made herself comfortable. 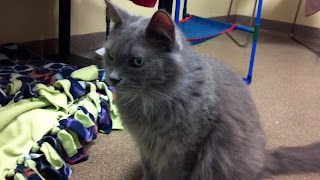 She's a Nebelung mix. She has a beautiful blue coat like Rosie, but a longer coat. She's a petite thing under all that fur! These girls love each other a lot, cuddling close and grooming each other. If you have room in your heart-and your home-for these two BFFs, they are available for adoption at Wayside Waifs in Kansas City. Last week's featured Waif was adopted on the following Saturday, so I hope luck continues this week and the same thing happens for Miss Virginia. Every time Mom sees her, she thinks of the Train song "Meet Virginia". Do you know what song I'm talking about? Other than the part about her hair always being a mess and stealing, the first verse of that song really fits. Virginia is beautiful. Of course a proper ladycat like her would never steal, she probably wouldn't even sneak extra treats if she had the opportunity. That wouldn't be very ladylike. Virginia is quite the lady. She likes to be petted, but only for a little while. When she's had enough, she lets you know. Also, she's not a lap cat, but is quite happy to sit next to you and have you talk to her. 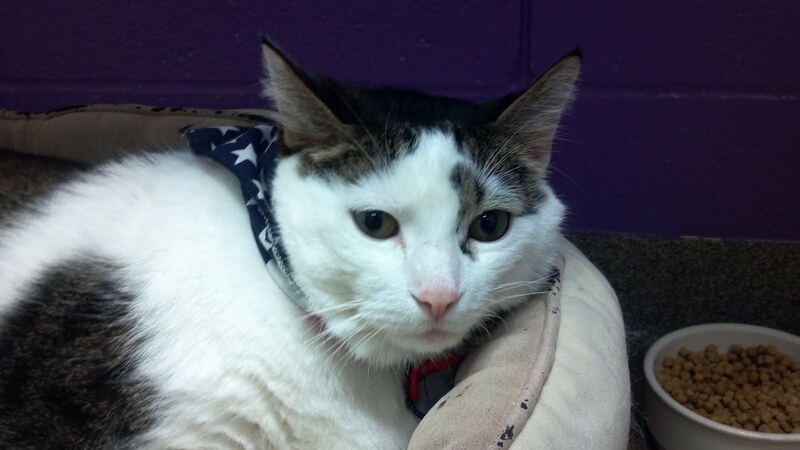 Virginia has been at Wayside Waifs for a few months now. The volunteers there don't know why she hasn't been adopted yet. She really doesn't have that many demands. She would prefer to be in a quiet home without children. She gets along with most of the other kitties at Wayside, so another cat in the home would probably be okay. She likes to play with ribbon toys. I would love it if you would help to spread the word about Virginia! She's a great gal who needs to have a life outside of the shelter.